Now you can gain the power and strength of Disney’s happily ever after by ingesting your very own living fairy tale on your wedding day. 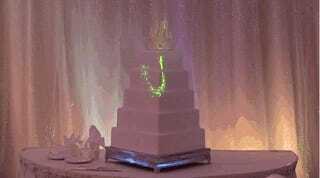 Disney’s video projection wedding cake is just so damn magical. Presented in all its splendor at the Fairy Tail Weddings Expo, this video cake will put you back a pretty princess penny. It’s only available in the “wishes collection” (a package that starts at $12,000) and in the Florida Disney location. But hey, if you’re going to eat a fairy tale and gain its powers of eternal love, you’re going to have to travel to where they live first.